These stunning new treatment rooms, heavily accented with Himalayan salt walls, are located directly off the salt cave. They can accommodate a single or couples massage and come with the complimentary use of an infrared sauna. Our sauna is dedicated exclusively to clients using these rooms. Please see our picture gallery. If this is your first massage with us please arrive 15 minutes early to fill out an intake form for your therapist. This information ensures your therapist has the details of your health and physical status to provide you with the best massage possible. Every massage is customized for each client. If using our Salt Therapy Treatment Rooms please arrive so as to allow 15 minutes prior to your treatment for the sauna. The Bien Soigne sauna uses infrared radiant energy to directly penetrate and warm body tissues. This technology allows it to be effective at lower temperatures making the environment more tolerable and breathing easier, reducing burden on the heart. The healing effects of infrared light have been widely documented throughout the world and include reduction of inflammation. Warmed muscle tissue and a relaxed body will also allow your therapist to provide you with a more effective massage. 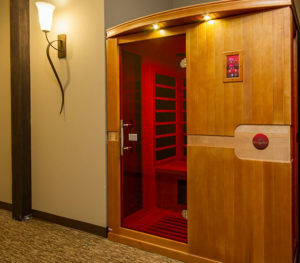 Because infrared heat can penetrate and warm body tissues without heating surface skin you will perspire significantly less than in a traditional sauna.